across the whole of the UK. We offer a professional solar panel cleaning service for both commercial and residential clients. This is the only service with which we provide a UK-wide coverage. Below are brief details about why solar panel cleaning is needed. Please visit our sister solar panel cleaning website for more in-depth information, news and case studies. Solar panel cleaning increases productivity and helps you see your Return-On-Investment sooner. Why Do I Need Solar Panel Cleaning? 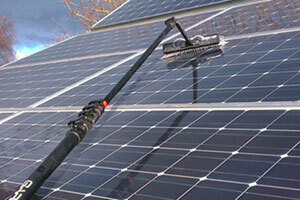 Solar panel cleaning in the UK is a growing industry, but in other places, it is a well established trade. It is recognised that solar panel cleaning is required every 6 months so the the solar panels can produce electricity to their maximum potential. Solar panels, like any outdoor flat surface will build up a layer of dirt which needs removing. Because your solar panels are on an angle, they will get dirtier quicker than the windows on your property. Just as your windows are not cleaned by rain, neither will your solar panels. There is an abundance of research into solar panel cleaning and all of it concludes that there are clear financial benefits from spending a little money on solar panel cleaning. Why Choose Us For Your Solar Panel Cleaning? We have equipped ourselves with professional solar panel cleaning equipment and put ourselves in a prime position to offer a professional solar panel cleaning service. We are fully insured specifically for solar panel cleaning. It is likely that your solar panels have been installed on a roof. While it is likely that a cherrypicker will not be needed on residential installations, we do hold an IPAF cherrypicker license which enables us to hire access machinery up to a height of 110ft. This enables us to carry out solar panel cleaning safely on commercial & farm buildings where health & safety is paramount. Solar panel manufacturers do not recommend using any kind of household cleaning chemical for solar panel cleaning. Using detergents for solar panel cleaning leaves a sticky microscopic film on the solar panel which actually attracts dirt and grime and cause your solar panels to become dirtier, quicker. We use specialised solar panel cleaning fluid. This has been used in other countries that have had solar panel arrays for many years. 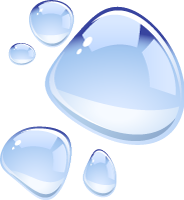 Our techniques and solar panel cleaning fluid are tried and tested. How Often Do You Need Solar Panel Cleaning? It is recommended by solar panel manufacturers and installers that you should have your solar panels cleaned every 6 months. Countries further down their solar panel journey than the UK have found that six-monthly solar panel cleaning is the most cost-efficient and produces significant results. In fact, some solar panel installers in the UK are following suit with their European counterparts and are making solar panel cleaning part of their warranty. Some solar panel warranties now state that a written record of solar panel cleaning by a recognised professional must be kept in order to maintain the warranty. I Was Told My Solar Panels Are Self Cleaning. Will Rain Carry Out My Solar Panel Cleaning? Firstly, some people have been sold solar panels under the guise of them being 'self-cleaning'. We can prove that there is a marked increase in electricity production even when so-called 'self-cleaning' solar panels have been manually cleaned. Secondly, rain will not clean solar panels in the same way that it does not clean Velux windows. By the very angle of all solar panels, they will naturally accumulate dirt. The best method of removing this is manual solar panel cleaning. Even some solar panel installers have come to recognise that their 'self-cleaning' solar panels do actually need cleaning and are now adding on solar panel cleaning as part of a solar panel maintenance package. We are so confident that your solar energy output will increase after having your solar panel cleaned, that we offer a 105% money back guarantee if it does not. Is There Any Way To Prevent My Solar Panels Getting Dirty? There are options available, but are very expensive. The cost for a homeowner does not make them a sensible option. Automated solar panel cleaners are available. One is a spray system that regularly hoses down the solar panels. This is what is used in some desert installations in the U.S. A different system uses an electric charge to lift the dirt from the solar panel and for those with money to burn, there is even a solar panel cleaning robot! All of these methods of solar panel cleaning are expensive. That is why the majority of solar panels all over the world are cleaned using the same methods as we employ. Where Do We Cover For Solar Panel Cleaning? We carry out solar panel cleaning across the whole of the UK on commercial and residential buildings. We also have experience cleaning large scale solar farms. Please see our sister website for more details.